TradingStockAlerts is focused on applying proprietary algorithms to ETFs and stocks to facilitate trading. You can use your own list of stocks or their proprietary recommendations. If you do not have the means to identify ETFs or stocks to consider trading and do not want to use proprietary lists, TradingStockAlerts provides screening tools with both fundamental and technical criteria. Quite a bit different than just telling you what ETFs and stocks to buy or sell. Both free and fee-based swing trading tools are available. Before registering, spend time going through the online documentation and how-to videos. The good news - there are videos and documentation describing all the available tools (free and fee-based) even before you register. In some cases, access is limited, but you can still exercise and learn about what is available prior to starting your free trial. Please don't forget to set aside time to use and learn the tools during the 30 day free trial. No point in signing up and then not having time to try it out. Identify the stock you want evaluated using the form located in the upper right corner of the screen. 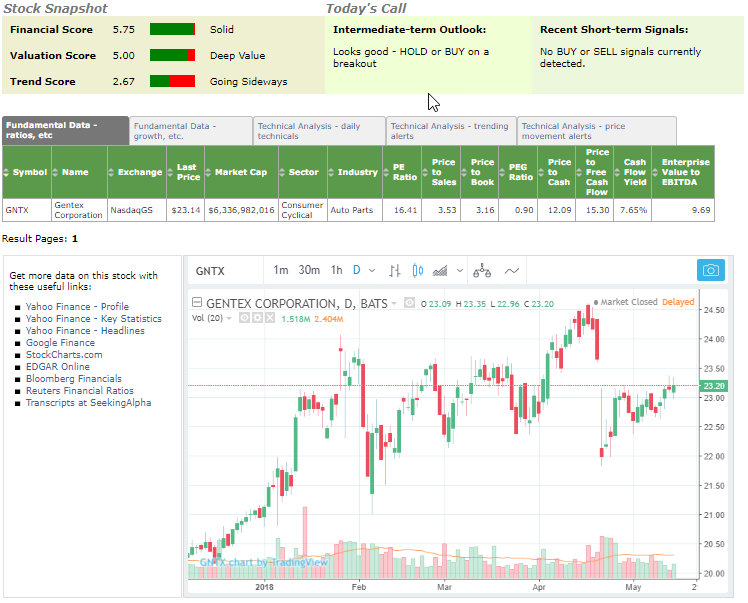 One of our models recently added Gentex (GNTX) to the model portfolio so we decided to use GNTX as a way to illustrate features of TradingStockAlerts. You get 2 fundamental scores and a technical score. Confirm the proprietary Financial and Value Scores for GNTX using the data in the Fundamental Data tab. 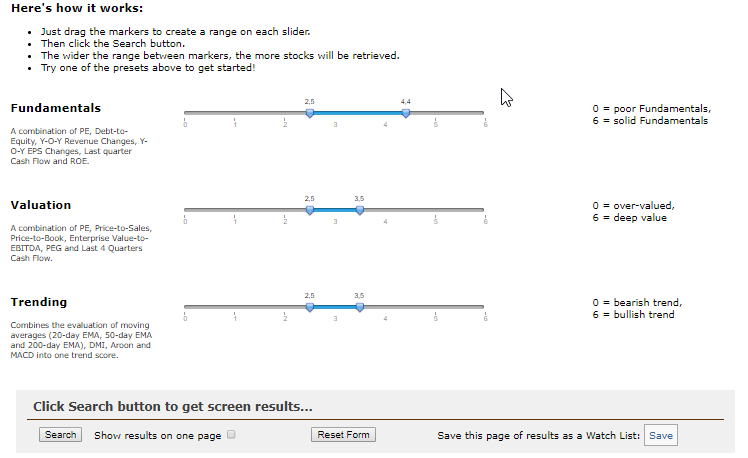 Use data on the Technical Analysis tabs and the chart to validate the Trend Score. Also provided is an analysis of the stock from a trading perspective as well as the existence of buy/sell signals. 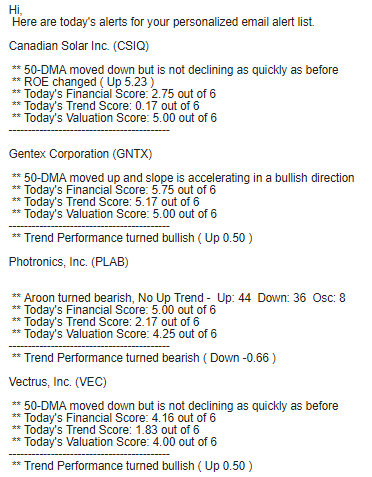 Links to the left of the chart expand the technical and fundamental data related to GNTX. This is pretty neat as well as free. This tool is available whether you sign up or not. 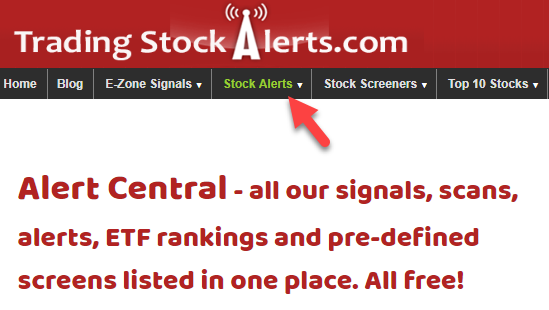 Use the indicated tab to access the Alert Central stock and ETF lists. In addition to the ETF rankings, there are over 25 of these lists and screens (also referred to as scans) for stocks and ETFs. So pick one of the lists and select a stock or ETF. Notice these are proprietary screens and factors generating lists of trading ideas. You are not selecting the criteria. Nothing wrong with that, it is the nature of black-box products. Notice also there is no fee - these are free and do not even require registration. At present, TradingStockAlerts provides 5 separate proprietary lists of top 10 stocks. Four of the lists include both fundamental and technical components, the 5th list (Breakouts) is strictly technical. Overviews and descriptions for each category are available. Unlike Alert Central, Top 10 lists are fee-based, not free. You do get access during your 30 day free trial. A total of 4 stock screening tools are offered. One is free, the others are fee-based. Below is the free stock screener they offer (no registration required). Note the criteria selection is liited and that only drop down lists are available to specify limits. And, even if you do come up with a really great screen, you will not be able to save it. If you really plan to use the same criteria in the future, print the screen once you have set your criteria. But, there is a video of how to use the screener. Well, at the very least it allows you to become familiar with their approach to screening before you register for the free trial. In other words, it is a form of documentation. Once again, you can exercise and learn about what is available prior to starting your free trial. A great approach to preparing potential users. Even better, you can contact TradingStockAlerts with questions. A black box screener which allows you to adjust the focus on fundamentals, valuations, and trending. You don't get to look at the details. But you do get a list of stocks. As shown below, it doesn't get much easier than moving three sliders and hitting the "Search" button. Without registration, this fee-based screener provides one example when Search is clicked. The ticker of the passing company can be entered in Stock Search. 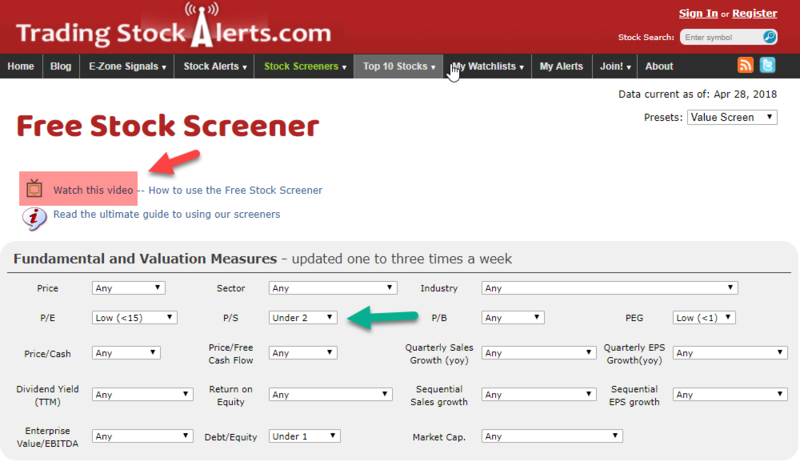 An extension of the free stock screener. In this tool, you get more choices and can save the screens you develop by name. An interesting feature is the ability to screen for stocks where fundamental or technical criteria have changed within the last few days or weeks. A screening tool focused on identifying favorable industries. Once an industry is located, clicking on it brings up the list of companies within the industry. Clicking on an individual company in this list takes you to the Stock Search page. The E-Zone system is the heart of the TradingStockAlerts system and is derived from the Hottinger ETF Signals. 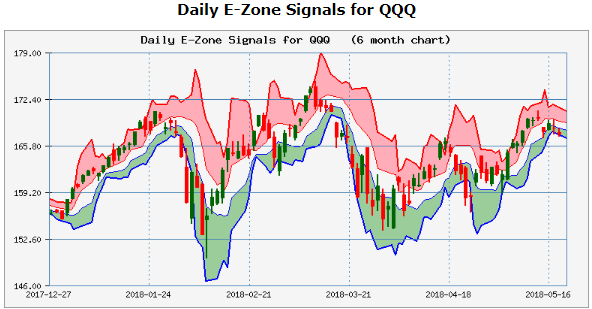 Although you cannot check any stock or ETF for E-Zone signals in the free system, TradingStockAlerts publishes the E-Zone signal (daily and weekly versions) for QQQ. During your trial period, you can use the E-Zone system for any stock or ETF. Once stocks or ETFs of interest are identified, TradingStockAlerts provides 2 convenient ways to track them. Five stocks of interest were entered into a watchlist. During the trial period, none came up with a sell signal. But it was an easy way to check their trading status. Our approach (not necessarily the best), was to go to the E-Zone tab and check the buy/sell signals directly from the list below. CSIQ (a selection from a TradingStockAlerts list) was entered into the alerts form along with 3 tickers selected using one of our trading models. NOTE: Item 4 is not directly available during the free trial. During our 30 day free trial, we took the opportunity to make 4 trades using the daily E-Zone buy/sell signals over 15 trading days. It is unrealistic to expect 100% wins, but it does illustrate the tools offered. During this 15 day period, the best index performance was the S&P Small Cap 600 with a return of 2.65%. The compounded return for the 4 trades was about 8%. Again, 100% wins is not sustainable. This is an instance of better lucky than smart. This black box trading tool is focused on swing trading ETFs and stocks selected by you. ETF and stock screening tools are provided to help you select appropriate trading candidates if you don't have appropriate tools. If you are going to try the 30 day free trial, take the time to go though the documentation and videos first. In fact, you may want to use the evaluation procedure outlined here. Keep in mind that TradingStockAlerts is oriented to trading, not investing. And don't forget to allocate enough time to exercise the product during your trial period.